Only the castle and the chapel have Alleuze as a name : no hamlet has this name. The Town-Hall is located in the main hamlet, La Barge. 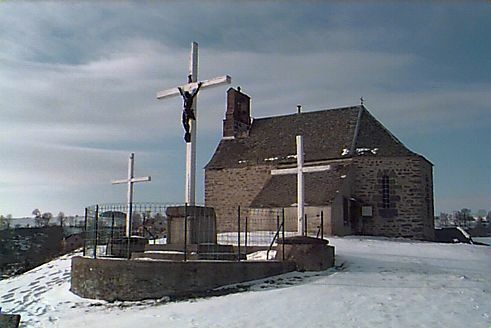 Church and Calvary of La Barge, main hamlet of Alleuze - Photo : Marc Duval, February, 1999. On this map, the hamlet of Alleuze are indicated with a yellow squares and blue writing. The hamlets are located on the plateau, at the extreme part of the Planèze of Saint-Flour. This plateau is separated into two parts by the deep valley of the Alleuze brook. That flows into the Truyère River, which is the southern limit of the Municipality. On the eastern side, the Ander brook, coming from Saint-Flour, marks the limit. Because of the Grandval barrage, the water-level of the Truyère increased and consequently it was the same for the Ander brook and especially for the Alleuze brook, which is now higher than in the past in front of the Castle (please see the section Old post cards). Then in the middle of this deep valley, stands like an island the steep hill, on which the Castle was erected. Thus the castle is perched on the top of an eminence, and yet the visitors can look down on it, from the plateau. (Please see the pages devoted to the landscape study about Alleuze : Like an eagle). 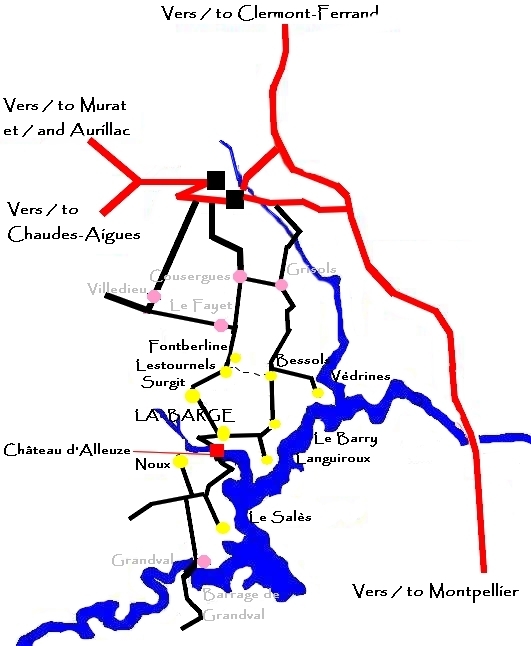 It is the reason why the visitors may park in La Barge, then go the centre of the village and contemplate the Castle from the Calvary located near the Church of La Barge. A Site House is proposed in the study mentioned above.